and to raise funds for research so that future cancer sufferers will have more and better options than did Sam. Worldwide, a child is diagnosed with cancer every three minutes. In 80% of children, by the time the cancer is discovered, it has already spread within the body. More than 90% of survivors of childhood cancers will have lifelong conditions from their cancer treatments. Only a tiny percentage of federal cancer research funding goes for treatments for childhood cancers. We can’t save Sammy, but we are raising funds to bring about better treatments for the children who will be diagnosed in the future. Current treatments are brutal and too often ineffective. Research dollars go to look for more effective treatments that do less damage to children. I am asking you, my readers, to participate in this drive by donating through my page at the St.Baldrick’s Foundation. Even the smallest donation will make a difference; I checked, and the website will accept a donation of even $1. St. Baldrick’s, by the way, is not a religious foundation. “St. Baldrick” is a combination of “bald” and “St. Patrick’s,” a reference to the fact that the first fundraising head-shaves took place on March 17, 2000. St. Baldrick’s Foundation is a good steward of the funds you donate; Charity Navigator gives it a coveted 3-star rating. If my words have ever been useful to you, or if the story of Superman Sam has touched your heart, I beg you to give, if not through my page, then through the page of some other rabbi you know. In these months of Adar, when “joy increases” let’s do something concrete to increase the years in young lives, and the joy in the lives of young families. To donate through my page at “36 Rabbis Shave for the Brave” and to donate to the St. Baldrick’s Foundation, please click here. Judaism is in many ways a religion of questions, not answers. In another story in our scripture, one of our patriarchs wrestles with a figure who is not identified: God? An angel? Himself? Our sages disagree. We are left to wrestle with it, and to ask questions. At the worst of times, we do not offer or accept easy answers. Today we buried one of our own, an eight year old boy, the son of parents who are beloved leaders in our community. No one connected with Sammy Sommer “deserved” to suffer, or was “improved” by his or their suffering. There is no reason, no answer for such suffering. We are left to wrestle with it. We are left with questions. As Rabbi Rebecca Einstein Schorr wrote, Sam is not “in a better place,” he did not “pass,” and today’s funeral did not “celebrate” anything. He died, and we mourn. We do not have any answers, only questions and memory. No one whose life was touched by “Superman Sam” will ever forget him. In the end, what we have is the stories: memories of Sam, just as we have memories of Abraham, and Isaac, and Jacob, memories of all the fathers and sons and mothers and daughters who have gone before us. Torah is not history, it is memory. It offers not answers, but stories. And we, the living, will remember. We, the living, will also wrestle with the questions, as we embrace the mourners in our midst. We accept the sorrow and we do not minimize it. As we stand with the mourners, we will ask ourselves, what could be different, in the future? What can we do? In the face of this terrible grief, what must we do? And those, finally, are the questions we can answer. 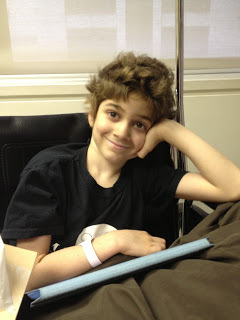 Friends and colleagues of Rabbis Michael and Phyllis Sommer are working to raise funds for pediatric cancer research as a memorial to Sammy, and as an answer to the question, “what shall we do?” To contribute or to participate in 36 Rabbis Shave for the Brave, follow this link.